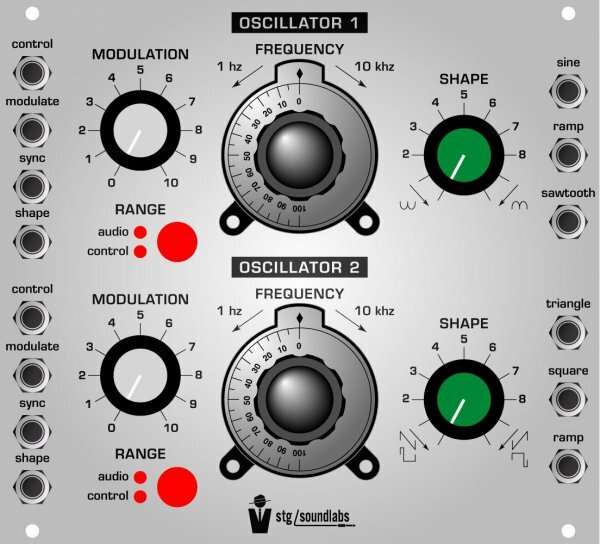 Does anyone know anything about the British Oscillator from STG/soundlabs? It is based on the EMS Synthi. There is a video of it from Namm 2014 but I can't find it anywhere online? Was this available for the public to buy or is it just a prototype? You and I both, mate. I, however, do not believe it ever made it out of the prototype phase. This is a different oscillator though, no? Yes, the other one was a dual oscillator with vc waveshape. Fun layout with its obvious vintage appeal and vernier dials, but I'm kind of glad to see a move away from such things. The dual panel seemed a bit of a funny design, with no obvious interaction between the two oscillators in the mock-up (not even sync switch). More a design dictated by nostalgia. The new one looks nice and compact, probably a better panel size/density for Euro, and the modulation drift seems like an interesting touch. And the $200 intro price looks nice, too. It will be fun to hear what it sounds like. STG does share a lot of never-to-be-released design concepts, but everything that makes it to the finish line that I have used has been top-notch. I believe it is a logical progression of the same core design but I too am a little ignorant of the exact similarities. As is the case with most of STG Soundlabs modules there is a foundation on some vintage design with the added imagination of Suit & Tie Guy to enhance beyond the simple clone. This is no exception and offers some very musical features like the potentiometer step weighting of the SEMItone control and Range knob as well as the inventive drift parameter. The vco offers LFO, octave switching, sub oscillator and free 5 octave sweeping all in the compact three knob design. This amount of tuning control is usually a tradeoff in most vco's. Not here. You get it all. Dynamite comes in small packages. I have two of these on pre-order. The sync function is another unique variation. The sub oscillator (square wave) is generated off the core reset so it is a bit different than some. I can see these paired well for a very unique sound. I'm anticipating a lot of dynamic harmonic performance with the drift and sub oscillator sync in play. All-in-all I am more interested in the whole feature set of this VCO than I am of a clone of the British vintage oscillator but that is just my perspective. One of these he had stolen at a show and it was the prototype and decided to redo it, i think it was the one with the dials, i remember reading about it. Shame, i'm not sure why he couldnt make another prototype unless he didn't document all the changes i guess, or was just so gutted he went in different direction. Anyway, Analogue Systems oscillators are based on EMS, i have 2, they sound great, i've never played a EMS synth though so i can't say how accurate they are, but, i use them all the time i must admit. yes, the prototype of the British Oscillators was stolen from me at the Winter NAMM 2016 convention. I decided it was a sign from God to revisit the design and I put it off for a while, actually. At Knobcon Number Seven (2018) I had a life-changing experience which put a thumbtack into a long period of situational depression caused by a number of factors including the loss of my best friend, DJ Frowntown. My holistic re-evaluation included a brainstorm about what my first VCO should be. I called my good friend William Mathewson (WMD) and had a discussion about using his high-tech analogue core from the PDO and Spectrum in an STG Soundlabs oscillator which included an abstract feature set inspired by my own fascination with oscillator drift and a long conversation at Knobcon 2018 with Erik Norlander about the best way to tune an oscillator for musically useful purposes. We discussed a feature set and he told me what it would cost me, and then I put my entire collection of vintage Roland drum machines up for sale. He promised me it would be ready for the winter 2019 NAMM convention. 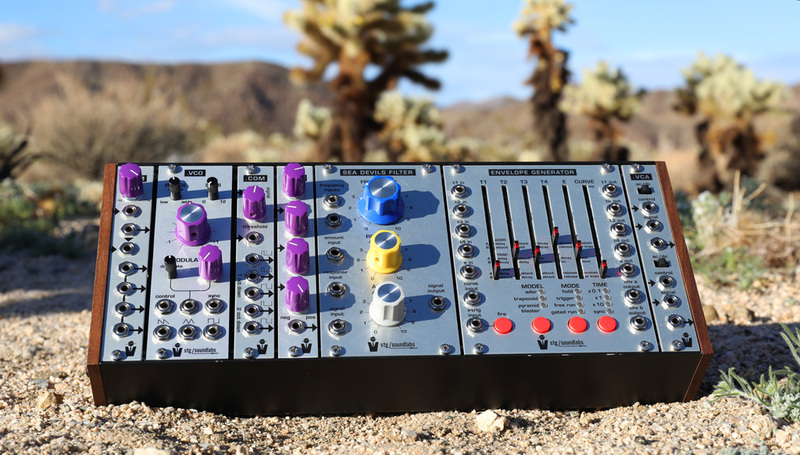 When I make the claim in the Synthtopia and Sonic State videos from NAMM that this is "the world's most advanced analogue VCO" it is not an unfounded statement. The core is pure analogue. It is a saw core with a high-speed switch which negates the need for high frequency compensation. I then married it to an ARM processor to generate the pitch offsets for octave, semitone, and detune. These 3 functions have their own channel on an external 4 channel DAC, so they are _incredibly_ accurate. those who see that i've shown things which never happened, or put layouts on Modulargrid, that never happened and you doubt wether this actually exist I only have this to say: everything I have ever taken an order for has actually shipped. there is nothing more to say. I've been at this since 2005, and often describe myself as "the biggest loser in Eurorack." my entire motivation in building synthesiser modules was initially a Moog 901 VCO clone. it's been a long and perilous journey, and I am finally at the point where i can show people what the power of this fully operational synthesiser is actually capable of, and I've never been happier. That’s great news STG I am excited to get my hands on that new oscillator. I heard Geoff (Sp?) playing that BRitish Osc and was blown away. Also my condolences to You and family for the loss of your friend. ..it's been a long and perilous journey, and I am finally at the point where i can show people what the power of this fully operational synthesiser is actually capable of, and I've never been happier. I hesitated for about a nanosecond before ordering these. OK that's a lie, I didn't hesitate at all. STG Soundlabs has always come through first at the checkered flag for me. The best part of my large format is STG modules, and I will buy this when it is available in that format too. The only other VCO's I have in Euro are an original Piston Honda with the extra waveform chipset, a Mysteron and Rings. Lotsa' digital. It's now time for a great pair of analog VCO's. This will be a classic set.